Geez, Cretia, can’t we get just a little more creative in our criticism? Thanks, Elana. The Daily News article is interesting. 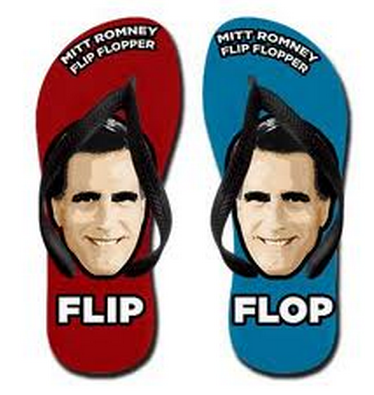 I think by now, many educated people realize that Romney is a big flip flopper. The problem, as I see it, is that Obama and Biden have not made that very clear. There are some very simple and clean campaign commercials that they could be running, juxtaposing his position on abortion years ago to his supposed position today. But what often happens in campaigns is the professionals get too caught up in “cute” messages (like the Big Bird commercial) and they forget how to do something that is simpler and, I would suggest, more effective. The bottom line is that Romney is getting away with murder here. There are too many folks out there who are buying his stuff. This election is way too close and it shouldn’t be. Obama has got to cut his balls off tomorrow night…..
Isn’t it a little strange/ funny/ ironic that the the election will be decided more by the morons that are presently undecided on who they are going to vote for? The rest of the country is pretty much dug in to their vote. So it is almost up to these people that still have brain fog . . .
Romney is a Jerk. I am voting for Obama. Our country will be ruined by a knucklehead like Romney and his Catholic idiot sidekick Ryan. Got something against Catholics, Paul? Their doctrine is inherently misogynistic. Calls for the ban on birth control. The institution has murdered millions over the years. The Priest Pedophilia . . .
And the story goes on and on . . . I do not wish for my tax dollars to be used to fund anrtoiobs. 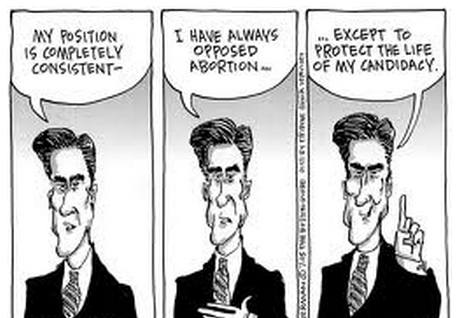 I am pro-life and not pro-death and therefore do not condone the killing of unborn babies. Abortion, which stops a beating heart, is the killing of unborn babies by mutilation and must be excluded from any health care reform bill. So, Frita, what do you do for them AFTER they’re born to show how much you care for them as real children? Are you a Big Sister, a public school classroom volunteer, a foster parent, an adoptive parent, a family court guardian ad litem? The minimum acceptable level of commitment to be truly “pro-life” is 600 unpaid hours a year and 8% of your gross annual income spent directly with or on a child whose parents can’t or won’t care for it. What’s your track record in being consistent in the long term for caring for what self-proclaimed “pro-lifers” call human life? Who came up with that 600 hour figure? I cam up with that 600-hour figure, Pat. It’s what I used to do for years after I got an empty nest. I figure if I could do 600 hours– and 8% of my gross income– annually, anybody else can. So, Fitz, I assume you oppose war and the death penalty, correct? Also, a close relative of mine had an abortion and now she has two kids. What do you think of her? If you were face to face with her right now, what would you tell her? Obviously, Gov. Sununu is supporting Mitt Romney. He’s iirnognng Romney’s support of a Universal health care model in MA, yet critisizes others that may pose a challenge to Gov. Romney. Gov. Sununu: just stop pretending and say you support Mitt Romney. They you two can bond by hunting squirrels (a few times), march with MLK, and ignore your younger days of youth and liberalism. As one NYRB writer put it, Rmoney is absolutely Nixonian in his pursuit of the presidency. He will say anything to secure it. And now, as he keeps flip flopping comes this quote from an interview yesterday: “I think the most effective next step is to have the court return the decision (Roe v Wade) with regards to abortion to the American people and their elected representatives.” So, he doesn’t have a legislative agenda, supposedly, but he wants Roe v Wade overturned. Obama better raise this issue tonight!!! I made this point a couple of weeks ago. He would get 2-3 SCt appointments, they would be far right, and RvW would be overturned, leaving it up to the states where total outlawing of abortion would result in many states. Another thing the right doesn’t like is Title 9. Many women who got good jobs (other than teaching) post 1975 (or thereabout) did so due to Title 9. Unfortunately, many anti-choice women don’t understand this and will, in essence, kill off the opportunities for their granddaughters. In John Dunkle’s case, its his great granddaughters who would end up with the jobs short stick. I wonder if john cares? David, it’s not that he won’t care; it’s that he CAN’T care. Fear and hatred of abortion overwhelms his sense of proportion. He simply cannot relate to their future handicapping. You’re right, CG, that he will say anything but Obama has got to call him on it and it just feels to me like he is not doing that effectively. Oy..
Are you going to make a comment on the debates tonight? Do you think they will actually bring up the most contentious issue in America, Abortion and women’s liberties? Or just avoid it as usual? Gosh! What is this? Battle of beliefs? Or battle of good and evil? Or maybe battle of the evil and less evil? I am really terrified! Such are truly awesome YouTube movies, its my fortune to pay a quick visit this website And Some people that support Abortion Rights are Still Considering Voting for this Anti Abortion Turkey? | Abortion – Abortion Clinics, Abortion Pill, Abortion Information and finding these awesome YouTube movies.